Laser liposuction is a liposuction technique which involves the use of a laser to dissolve the stubborn pockets of fat that prove resistant to diet and exercise. After selectively breaking up fat cells they are either removed using a low-level suction or by absorbed back in to the body via it's lymphatic system. Due to the minimally invasive nature of Laser liposuction it can easily be applied to treat difficult areas such as the knees, chin, upper arms as well as fat from the inner thighs, hips, upper arms, ankles, upper and lower abdomen. Laser liposuction has to become the preferred method of fat removal in recent years, due to the fantastic success rates that the surgical procedure is now achieving. The revolutionary concept in fat removal causes minimal discomfort as well as little bruising and there are hardly any side effects. Laser liposuction is being used increasingly across the UK & Ireland with patients on average paying around £2,770 per area to be treated using this revolutionary technique. People have different opinions regarding the success of laser liposuction. Some claim that they have seen a great difference in their body shape, whilst others report that the result was less significant. It certainly seems that laser liposuction can make a difference to the areas of the body targeted, but it's important to remember that any changes will only be temporary if the underlying cause for the build up of fat is not tackled. The only way to retain a changed body shape permanently is to lead a positive lifestyle with exercise and healthy eating. Nowadays with growing competition as well as constant improvements in technology and design in all forms of cosmetic surgery, there are a number of various laser options that are currently available. While explained below, it is always recommended that you speak to your GP or surgeon to establish which option would suit you best. 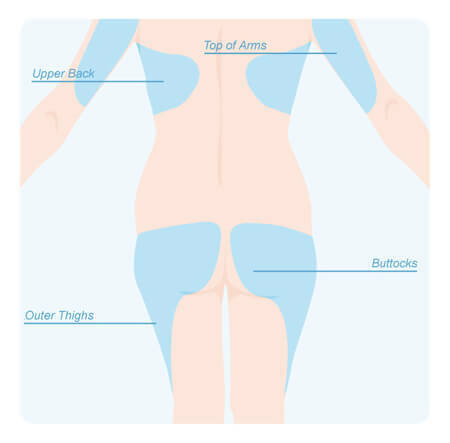 Laser lipo can either use a laser on the end of a fibre optic probe that is inserted into the area to be treated or can be in the form of a laser pen applied to the outside of such areas as the chin, knees and cheeks. What Laser lipo method is used will depend entirely on the size of the area being treated and the amount of fat that needs removing. Once the fat tissues have been dissolved (Lipolysis) they resemble an oily substance which can either be gently suctioned away or left to the lymphatic system to be removed via the liver. SmartLipo pioneered the laser liposuction method of fat removal. Its initial laser used a 1064 nm wavelength to dissolve the fat and coagulate (seal off) blood vessels. A newer generation of the technology, SmartLipo MPX combines the 1064 nm wavelength with a 1320 nm wavelength for greater effectiveness. While SmartLipo is the most common and popular form at the moment, other techniques such as SmoothLipo, LipoLite and CoolLipo offer varying forms of laser assisted fat removal that claim to be equally as efficient as SmartLipo. SmartLipo Laser Lipolysis uses a laser probe as small as 1mm in diameter with the laser attached meaning that there are no stitches required and no scars and thus is considered a non invasive procedure. Smart lipo is ideal for treatment of the knees and other awkward areas requiring the removal of unwanted fat deposits. Smart lipo laser liposuction treatment prices in the UK are around £2000 per area treated with discounts normally available if more than one area requires treatment. Prices will be dependant on the reputation of the clinic and surgeon carrying out the procedure and whether any hospitalization is required. Unlike normal liposuction, laser liposuction is not available on the NHS, only as a private procedure. However, this means that you may be able to undergo treatment within a relatively short space of time. Also, as the procedure takes place under local anaesthetic, there is no need to remain in hospital, and you will not need to recover from the after effects of a general anaesthetic as you would with normal liposuction. Furthermore, because the fat is broken down by laser, it is easier to remove, and the laser may encourage the production of collagen and elastin, resulting in firmer, tighter skin. The laser technique also coagulates small blood vessels, so you may suffer less bruising than with traditional liposuction. The recovery time is also likely to be faster than with other techniques. As laser liposuction can only be done privately, cost can be a significant drawback. However, many clinics do offer flexible payment arrangements. A great deal also depends on the skill and experience of the surgeon. Always ensure that the surgeon you choose is reputable, and has a good track record in carrying out laser liposuction, as an inexperienced practitioner may not be competent and you could suffer injury as a result. If the temperature during lasering is not monitored carefully, you could suffer burns. Your skin could also be damaged by the laser treatment, and older patients may find that elasticity does not improve and their skin remains saggy. 0% Interest Loans - Many clinics are now offering patients the chance to borrow up to £15000 to help finance their Laser lipo treatment at a more than generous 0% rate of interest. These must be paid back over an agreed amount of time with payment plans starting from as little as £79 per month. 'Buy Now Pay Later' - Using this scheme many clinics will allow patients to have a 6 month 'holiday' free of payments before having to repay the amount borrowed for their Laser lipo procedure as a complete amount or over an extended amount of time with a pre-agreed rate of interest attached. Monthly Payment Plans - This usually involves the patients paying a clinic a substantial majority of the overall payment up front (usually around 65%) and paying of the remaining amount over a number of monthly payments. Usually clinics that offer this payment method will not add additional interest to the cost of the Laser lipo procedure. Any person looking to fund a course of laser liposuction through a finance plan should always seek independent financial advice from a 3rd party before committing themselves. Some of the best laser liposuction clinics in the UK are located in London and especially the Harley Street area of London. These clinics will have years of experience performing laser liposuction techniques such as internal and external laser liposuction. External liposuction uses a laser directed into the fat cells from outside of the body prior to surgery and internal laser liposuction uses a laser attached to the end of the cannula and breaks down the fat during the operation. Top laser liposuction clinics in the UK will employ or be run by highly trained and experienced surgeons with very high surgical success rates.